The following is an excerpt from Dorota Sadovská's interview with the daily newspaper Pravda conducted in 2017. Q: The exhibition "Yellow Embrace" features 22 paintings of 11 men and 11 women that surround you as a visitor, almost embracing you as you stand in between them. You paint them naked, as bodily and spiritual massifs that are carrying a message. Painters used to employ garments and objects characteristic of saints. Is it harder to not be able to employ them? A: I wanted to grasp the essential, the universal about a given figure and that is why I got rid of hair, garments and other attributes, so that I am left with just the body, gestures and emotion. These paintings carry interesting stories that we can grasp only through the acceptance of the metaphorical language of comparison. People used to understand visual symbolic language much better, because it was simpler. Q: You didn't pick particular gestures based on their effect alone. Did you try to embed them with the saints' personality? A: Let's take St Francis as an example. In most paintings, his hands are wide open in joy, but it's not just about enjoying the world's beauty. It's much deeper than that – it's about the ability to accept life as a whole; the painful and the uncomfortable included. It's about the belief that they are still meaningful and are not a valid reason for you to lose joy and inner peace. A: The paintings are lit only by daylight and thus the yellow paint stands out exactly as it was painted. It is the most delicate bright color. I also believe that the stories are somehow amusing and the visitor, despite standing among saints, will see the humor and earthly stories in the exhibition. 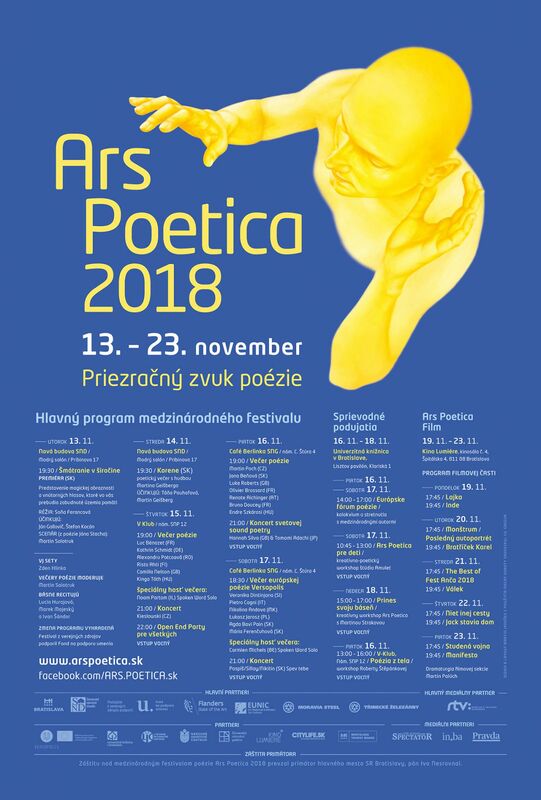 The Ars Poetica 2018 visuals were based on Dorota Sadovská's painting titled Saint Gregory.